Microgaming have a wide selection of sports themed slots and, the name suggests, Cricket Star takes its inspiration from that most traditional of English summer sports. The game’s five reels appear as if they are out in the middle of one of the world’s biggest cricket grounds and are populated by symbols depicting players, officials and fans from all over the globe. The slot’s payouts are perhaps a little on the stingy side but scatters, wilds, a Wild Wickets Feature and a Rolling Reels feature all help to boost winning potential and to add extra interest to gameplay. Cricket Star features really attractive symbols and fun sound effects, which help it to really deliver on its cricket-based theme. Wild symbols, stacked wilds and the innovative Wild Wickets Feature all help to bolster up what can be somewhat disappointing main game jackpots. 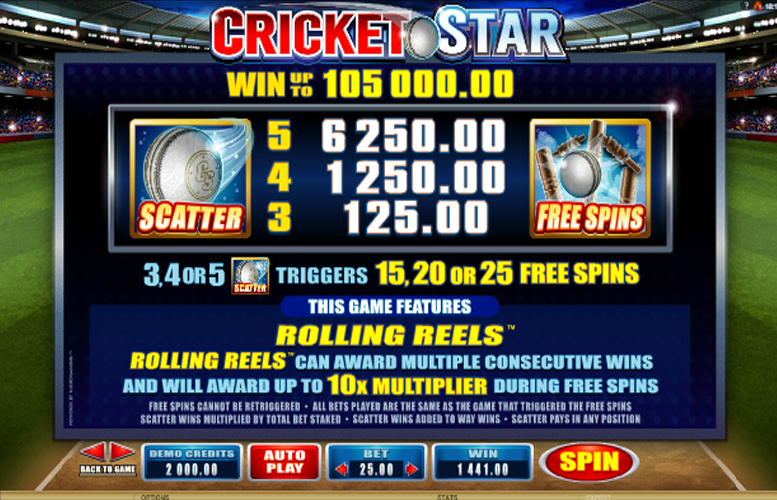 The Cricket Ball Scatter can trigger loads of free spins which, thanks to the Rolling Reels feature, can deliver consecutive wins and up to a 10x winnings multiplier. 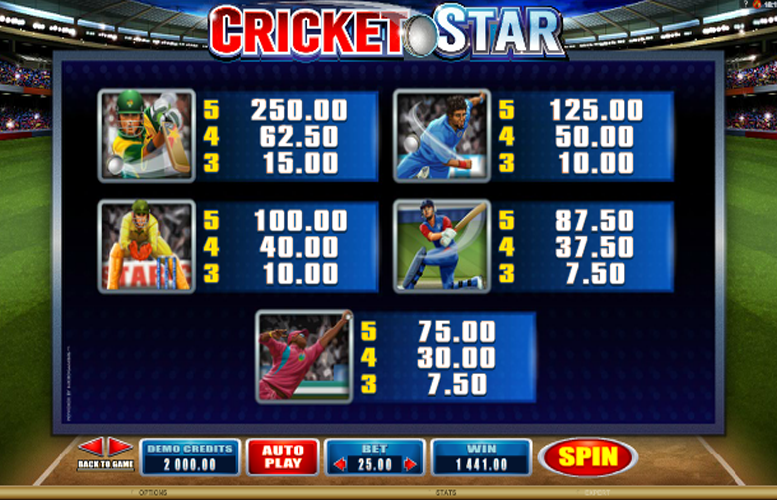 Cricket Star does not include any bonus round or second screen game, which is especially disappointing as the slot’s theme seems to lend itself perfectly to one. The standard payouts available for winning combinations appearing on the Cricket Star reels, when none of the extra features are applied, are a little disappointing. It would perhaps be nice if the Cricket Star reels featured some kind of animation to reflect the action and dynamism of cricket. 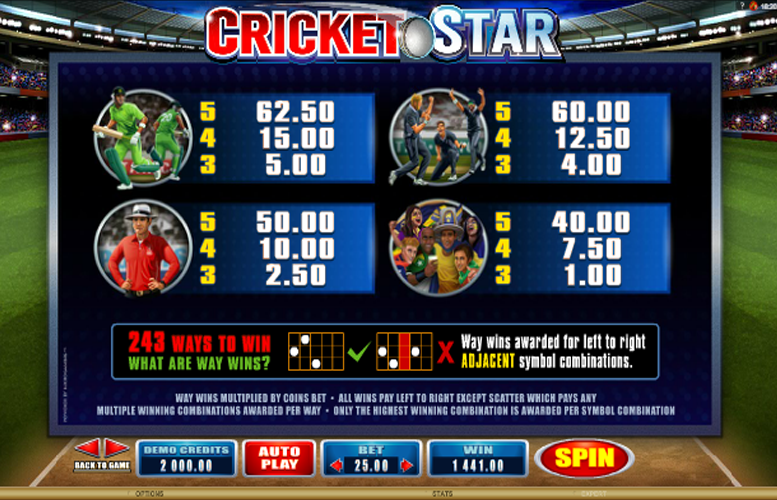 The real money on the Cricket Star slot however is won during bonus rounds and stands at a max jackpot of 105,000 coins. 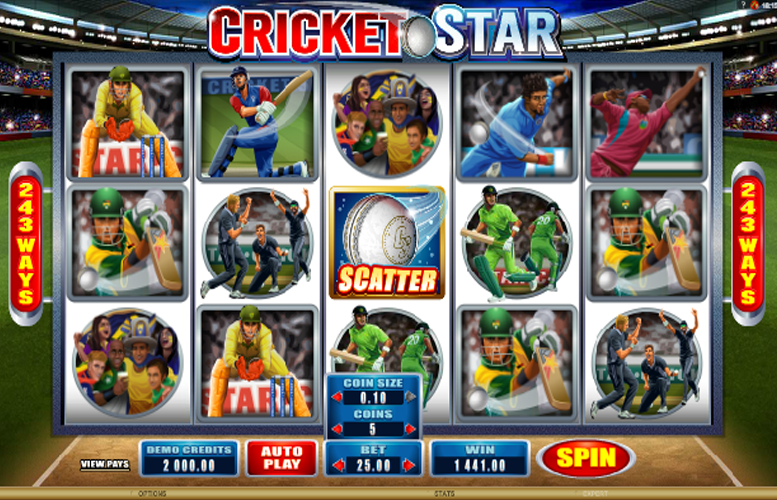 Whilst Cricket Star does not have a bonus round or a second screen game, it does include a handful of additional gameplay features to liven up the base game. The slot’s Wild Wickets Feature means that at random intervals the second, third or fourth reel will become wild, delivering a guaranteed win. ‘Cricket Star’ Wild symbols, meanwhile, can substitute for all symbols except the game’s scatter to provide further winning combination after a spin, and can appear stacked on reels three, four or five. 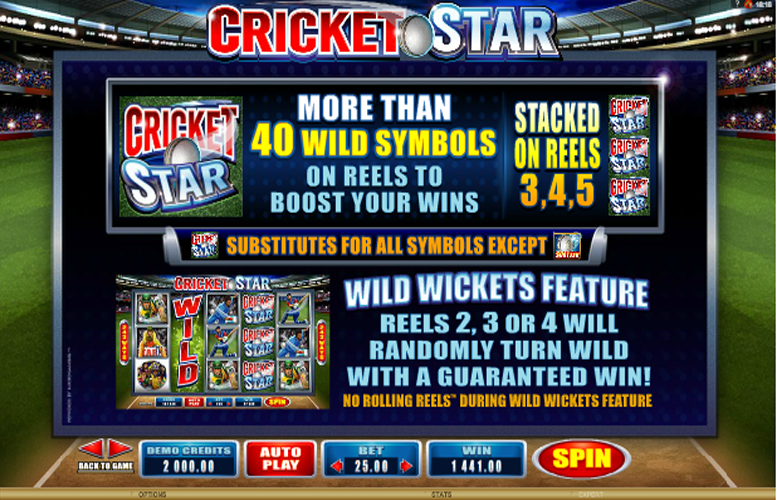 If three, four or five of the aforementioned ‘Cricket Star’ Wild symbols appear on the reels after a spin, 15, 20 or 25 free spins respectively, are triggered. Those free spins cannot be retriggered but during the course of any set of them, the slot’s Rolling Reels Feature can deliver multiple consecutive wins, along with an up to 10x winnings multiplier. Given that Cricket star is a 243 ways to win style slot, players obviously have no control over the number of active paylines. The ways in which they can alter their bets per spin, therefore, are by either altering the number of coins they wager or selecting a different value for each coin. Anywhere between one and ten coins can be bet per Cricket Star spin and each coin can be set at a value of somewhere between 1p and 50p. A 50x bet multiplier is then applied, meaning that the minimum possible wager is 50p and the maximum is £250. There’s plenty to like about Microgaming’s Cricket Star slot. The game’s graphics, sound effects and symbols really put players in the shoes of an international cricketer and make gameplay really fun and immersive. Additional features such as the Wild Wickets Feature and scatters that trigger free spins, what’s more, help to make gameplay even more interesting and less repetitive. What the additional gameplay features also do is to introduce different ways to win and help to boost standard payouts. That’s important, too, as the standard jackpots offered by Cricket Star are not nearly as generous as those provided by some similar games. Aside from those slightly disappointing payouts, the other main weakness of Cricket Star is that it doesn’t feature a bonus round or second screen game. This game has a rating of 4 / 5 with 385 total reviews by the users.